I started making giant plush squid out of curiosity. Since giant squid live in the deepest parts of the ocean and have not been seen alive until recently. I’m fascinated by these animals and but how would I ever get to see one in person? The answer seemed simple: I had to build one. After getting a ton of encouragement from friends I ventured to make 9 more. They sold within the first week. From there I showed at galleries and got featured in newspapers and magazines in languages I couldn’t read. I made more and more, coming up with names and personalities for all of them. I made microsites and came up with fun marketing schemes. The squid project was a joy. 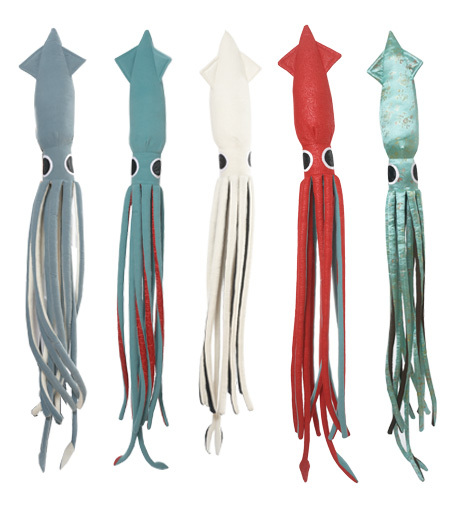 Its been quite a few years, and the worlds need for plush giant squid has all but fizzled out but I still do occasionally make squid.